I am rather obsessed by the quality of the materials I put into my paintings from the surface, up, for a number of reasons–not the least of which is I want them to be around l-o-o-o-ong after I’m gone. Also, when someone hires me to do a job, I want to make sure it is the best I can give–I feel I owe that to people placing their trust in me. 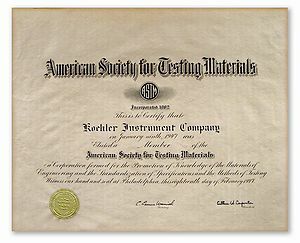 ASTM stands for the American Society for Testing and Materials and it is the organization that helps to internationally standardize a very large number of materials including paint. The “P” stands for “pigment” and the letter(s) stand for R-red, Y-yellow, B-blue, Br-brown, and so on. The numbers after the letters indicate the specific pigment. This is why you will find that the “PR83” (a very impermanent but much-loved pigment) on your paint tubes means “Pigment Red Alizarin Crimson” in the ASTM standard, no matter what brand of paint. But you can’t go by the name companies put on the face of their tubes–that is just a label and an oftentimes misleading one. For example, Utrecht has an oil paint labeled “Titanium White” but in checking the label closely, we find it is NOT just titanium white (PW6), but has zinc white (PW4) in it as well. PW4 has undergone extensive study at the Smithsonian Institute and they have determined it will make your paintings crack over time. When I learned this, I checked all the tubes in my paintbox and got rid of the ones that had zinc white in them. Napthols fade in tints. Even those classed as ASTM 1 barely scrape in. Noticeably less light fast. There are other reds that are far superior. *Hansa Yellow Medium aka Arylide Yellow G, Azo Yellow PY 1 ASTM l l (Fades in tints. *Vine Black also called Drop Black, Frankfort Black, Peach Black, Spanish Black, Blue Black. *Metals PM 1, PM 2, PM 3, etc. ASTM – Not tested. All except gold are poor. Pigments throughout the world are given a Color Index Name. This is an international code. Remember that the science of paint continues to evolve, bringing us ever-more exciting options to use; so do some research on your own and learn more about it. I’ll be posting more information on this next time. following the procedures of the Old Masters of the Renaissance. or crack like wood panel, and is highly resistant to warping. have so much depth and luminosity. charcoal drawing directly onto the surface. azuraccio, grisaille, or bistre, depending upon the subject. being the final protective (and removable) coat. me more personal control over the quality of pigment and grinding oils used. When I sell a painting, I always make sure to teach people how to care for it. I can’t expect them to already know this; they appreciate fine art but generally don’t create it themselves. So here are the instructions I provide with the painting to make it easier for buyers, AND to assure that my “progeny” going out into the world will stand a chance of surviving a few hundred years. surface from damage by sticking to the frame. at 68-72 degrees with 40-55 percent humidity. smoke from cigarettes or a wood fireplace will discolor it. surface dust with a damp, lint-free cloth (water only). 5. Hang the painting so that it tilts slightly forward at the top. This helps keep dust off and cuts down on reflected light. reflections on the museum finish.